There is no denying babies are cute, cuddly and amazing, however, their nappy content is far less desirable! Mustella created a wonderful baby fragrance to ensure your baby smells sweet all the time! This beautiful can be used from birth and is safe for the babies skin! You can spray it directly on the skin or my favourite, on the nappy, or even around the nursery! Keeping those nasty smells at bay and it has been dermatologically tested under pediatric control for optimum safety. 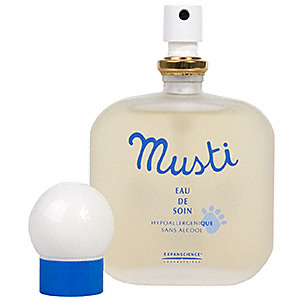 This 92% natural fragranced spray gently refreshes your baby’s skin and hair with the delicate, powdery aroma of Musti. The alcohol-free scent is created with a stimulating blend of cornflower and lime extracts, which help your baby’s olfactory senses to develop. Available for £12.50 at CocoonCenter, Escentual and other good pharmacies.